Enjoy stylish and durable laminate flooring in any room of your home or business from our dedicated company. Adding a laminate floor to any area of your home is a perfect way to increase your property’s real estate value, enhance the appearance of an older room, or improve a family member’s asthma and allergy symptoms. With laminate flooring installation by our specialists, you’re able to enjoy stunning, long-lasting floors for many years to come. Because they are hypoallergenic, repel dirt and dander, and have little-to-no maintenance needs, laminate floors are the perfect choice for any home. They have a natural resistance to mold and bacteria. Whether you’re going for a classic or modern look, there’s a laminate style to suit your needs. We carry laminates in a full range of appearances by popular manufacturers like Floorcraft™ and Star Values™. These reliable and trustworthy brands are sure to provide you with years of beauty and functional value. Why Choose a New Laminate Floor? Your life is busy and exciting, so you don’t have much time to devote to cleaning your floors every day. A laminate floor is ideal for use in busy households or for people who prefer to spend their valuable time doing more enjoyable things. Maintenance for these floors is simple and easy. All you need to do is sweep it occasionally and periodically clean it with a mild cleaning solution sprayed on your cleaning cloth or a damp mop. In addition, this flooring is great for people with asthma, allergies, or other respiratory conditions. Unlike other types of floors, laminate does not trap dust, pollen, pet dander, and other allergens, so you and your family are not constantly breathing in these things. Instead, they rest on top of the flooring, allowing you to simply sweep or wipe them up occasionally without needing to drag out a clunky vacuum. Always make sure your new flooring is installed by our team of laminate flooring installation specialists. This ensures that your flooring is installed properly to prevent damage to the subfloor, crooked flooring, or warped materials. With proper installation by our team, your new floor is sure to last for many long years. Enjoy the elegant appearance of wood floors with the easy maintenance of laminate flooring. Our installation team is able to make sure your floors are installed in a level fashion and proper sealing to prevent mold or moisture infiltration. Best of all, you’re able to enjoy a more fun or important task while we take care of the installation. Modern homeowners and buyers love the look of hardwood floors and the convenience of laminates, so our selection of gorgeous laminate floors is the perfect way to increase the real estate value and desirability of your home. Laminate floors are an affordable way to enjoy the timeless look of hardwood flooring which is sure to appeal to a wide population of prospective homeowners. 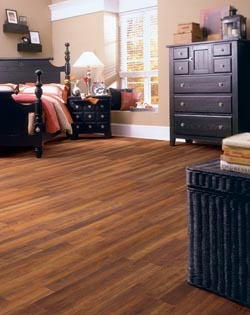 Put something beautiful under your feet by visiting us for a wide range of laminate flooring products. Available in many colors, designs, and sizes, our laminate floors truly cater to anyone’s preference. Whether you’re looking for laminate that looks like tile, wood, or stone, you’ll find it in our showroom. Tired of your worn-out floors? Ragged carpets and scuffed-up tile do nothing to improve your home’s indoor appeal. Why not give your living area an upgrade? With so many selections in stock, we are sure to carry the exact product you want. Most importantly, we are part of a nationwide flooring company. That means we have access to thousands and thousands of laminate floors, as well as tile, hardwood, and carpet. If you don’t find what you want at our store, we’ll get it for you. A new floor doesn’t have to be expensive. In fact, when you shop at our store, you’ll enjoy free estimates, financing options, and special offers. Currently, we are offering a special discount on our laminate wood and laminate tile flooring products: $100 off your purchase! Best of all, you’ll never need to compromise on quality. We carry the most trusted flooring brands in the industry, such as Star Values and Floorcraft™. If you want the look of tile but the durability of laminate, we have the solution. You can’t go wrong with laminate tile. Due to the manufacturing process, laminate tile is made to appear like actual tile – stone, ceramic, or porcelain. Long-lasting, appealing, and affordable, these floors are the ideal choices for many home and business owners. Simply choose the look you want and the color, and you’ll have the appearance of tile or wood throughout your entire room. For a free consultation, contact us today or stop by our store to speak with one of our experienced flooring staff. Contact us to choose from our wide variety of laminate flooring options. We proudly serve Yuma, San Luis, Somerton, Wellton, and Dateland, Arizona, and the surrounding areas.